First launched back in 2008, SecurityGateway is the brainchild of Texas-based Alt-N technologies, developer of the popular alternative to Microsoft Exchange, MDaemon Messaging Server. When Alt-N realised that even users of Exchange were buying MDaemon to use as a pre-filter because of how well the spam and virus protection performed, it wasn’t long before they took the decision to release a standalone, purpose-built product….enter SecurityGateway. What’s new and of interest in version 3.0? Several iterations on, Alt-N have taken all of the things that are great about SecurityGateway (the security technology), and addressed the feedback they’ve had from customers regarding where it could improve (packaging and commercials). Per user licencing – Purchase the exact number of users you require (always a minimum of 5). Dramatically reduced pricing – An aggressive strategy to displace key competitors in the market means the new pricing model for SecurityGateway is very competitive indeed. Enhanced security add-on bundled free – Previously a chargeable add-on, ProtectionPlus which added Outbreak Protection and an additional virus engine is now simply included as part of SecurityGateway. New virus engine – A Cyren antivirus engine now replaces the Kaspersky one to compliment the existing ClamAV. FREE not-for-resale licences – If your business is IT support, claim a free licence for your own use by joining our partner program. 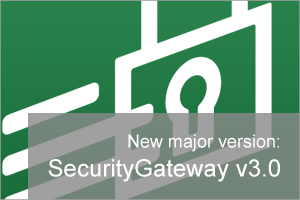 You’ll find all of the detail concerning the new and improved version 3.0 in the release notes on our web site and if you’d like to know more about SecurityGateway these links are a good place to start. As always, we are more than just blog post writing machines, and it’s always great to hear from you so if you’d like to chat in person about SecurityGateway, please feel free to get in touch!